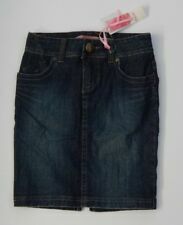 Lee Vintage Denim Skirt Size 6-8. Medium Blue Wash. Floral Pockets and Design. Condition is Pre-Owned. Sent with Australia Post Pre-Paid Parcel Post Satchel 500g. "Indigo" dark denim skirt with front button & zipper closure. LADIES DENIM SKIRT. Two front pockets & two back pockets. Split at back. Great little skirt, good quality fabric with a striking pattern. Skirt is in good condition. Style Flounce Skirt. Designed in rich boiled wool, this flouncy style is made for a cozy spin.Hidden back zipper with hook-and-eye closure. 18 1/2" long. 40% Wool, 60% Viscose. 100% Polyester lining. A HEAVY COTTON SKIRT WITH POLY LINING, SIDE ZIP IN EXCELLENT CONDITION. 70CMS WAIST \LENGTH 55CM. 98% Cotton 2% Elastane. Button & zip front closure. 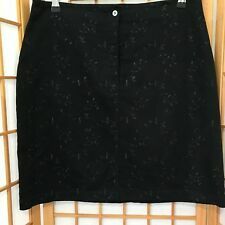 This is a lovely pre loved LAFAYETTE 148 NEW YORK petite fitting skirt. It's a straight pencil skirt. Would look great with a tight black top and black tights. No waistband, waist blends in with skirt. It's in excellent pre owned condition. Super cute and striking cotton 'Junk', full skirt. Pockets in the sides. Supre cotton knit full circle skirt. Blue with orange stitching (It is darker than the photo shows). Local pick up is OK. Very good condition. U:805004098523|Style:100007791P|Rep:|schart:yes|Minutes:1|Am:create. Length: Above Knee. Style: Straight, Pencil. L:Aleister on 03-12-2019 09:12|C:8.65|P:22.49/31.97|Q:1|W:0.78|station:Web|image:Model. ladies Denim Skirt Size 8 From Jeans West, In Perfect Condition, Never Worn.. .
Liz Claiborne skirt (Sz 10P) in woven cotton fully lined Aline back zip and red cotton tshirt in an M pull on by Liz Claiborne. In great condition, only worn a few times for boot scooting dances - USA size 6. Alannah Hill womens size 8 linen pleated skirt in ash pink with lace accent. Alannah Hill womens size 8 linen pleated skirt in ash pink with lace accent. . Sent with Australia Post Pre-Paid Parcel Post Satchel 500g. Ann Taylor. Petite: 17.5" long on average. Zip-Front Utility Skirt. Front flap patch pockets with hidden snap closure. This is a super-cute skirt! Length Above Knee. Pattern Solid with front zipper. Pattern Striped. Take it for a spin! Cast in sun-washed stripes, this swishy cotton skirt leads fashion's front lines with modern ease. Piped front and back yoke. Hidden side zipper with hook-and-eye closure. Size Type Petites. Paisley Pattern. Pattern Paisley. Pencil Skirt. Occasion Career. Length Above Knee. Style Straight, Pencil. Color: Red, Pink. 100% Authentic Calvin Klein. Length: Above Knee. Style: Straight, Pencil. Good Condition- Light pilling on front and back/ Great new wardrobe addition at a great bargain price! U:|Style:sp9sr240|Rep:|schart:yes|Minutes:1|Am. 100% Authentic Caslon. Length: Above Knee. Style: Mini. - Machine wash, line dry. Machine Wash Cold. - Pull-on style. U:439044039620|Style:CN358493MP|Rep:|schart:|Minutes:3|Am:create. Size Type: Petites. U:404298470208|Style:HA372373MP|Rep:|schart:yes|Minutes:2|Am:create. Style: Stretch Knit. 100% Authentic Halogen. Length: Above Knee. 5% Spandex. Material: Cotton Blends |. 57% Cotton. Material: Cotton Blends. Features Rhinestone Beaded. Accents Rhinestone Beaded. Hits above the knee on most. Beautiful large rhinestone detailing on the front. Length Above Knee. Material Linen. Accents Rhinestone. Straight cut. Hidden back zipper with hook-and-eye closure. Back vent. 19 1/2" long. 54% Polyester, 36% Cotton, 10% Acrylic. Pattern Jacquard Dot. Color: Sand Shell Cream. Color Cream. Length Above Knee. Pattern Striped. Length Above Knee. Color Blue. UPC Does not apply. Material 100% Cotton.